I truly admire the start of the, Ghetto Nailz journey. 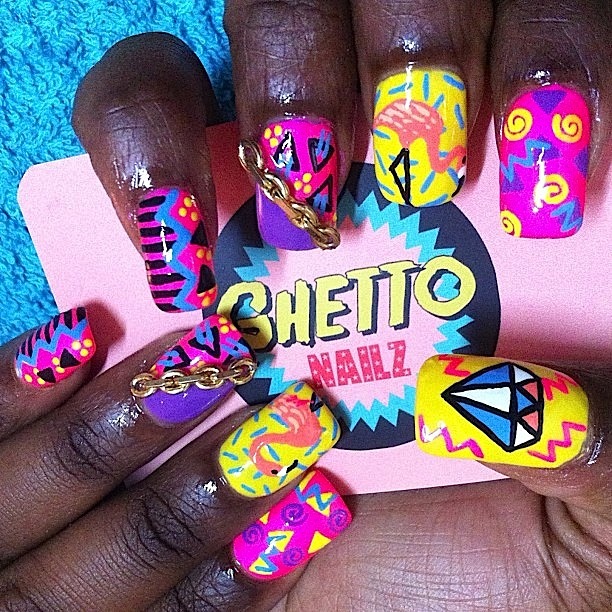 Share with my viewers how, Ghetto Nailz came about? Jessica: It all started when I came to, New York four years ago and I really wanted to know what is was like to live with long nails. I would see all the girls here with super long nails, and how they worked and did things with those nails. I got my nails done everyday and when I got back home (Spain), I realize no one got nails like that down there. People got their nails done but more normal. So time pasted and I continue to get my nails done and I met, Luz and she would always get her nails done so I told the girls (Luz & Andrea), “C’mon we can do this, lets start doing nails!”. That’s how, Ghetto Nailz started. 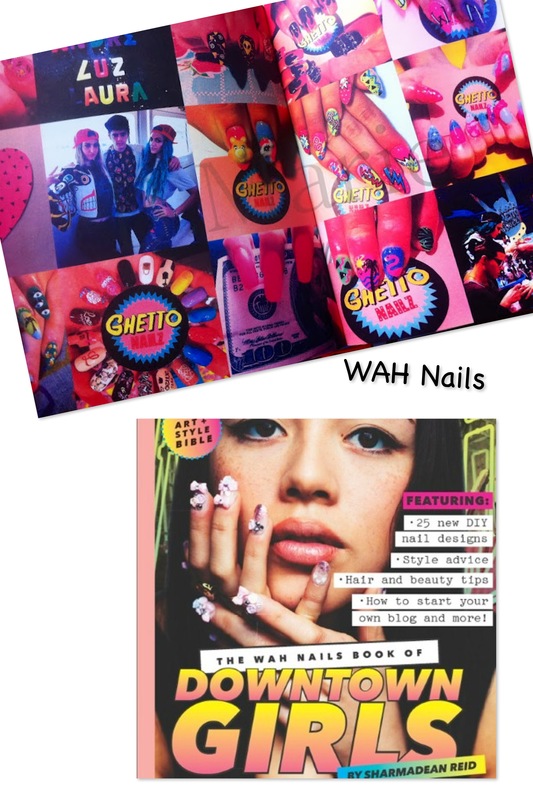 Congrats to the Ghetto Nailz feature in, WAH Nails latest nail art book “Downtown Girls”…How did that exposure change the dynamic for Ghetto Girlz? Luz: It made us want to work more for our dreams. 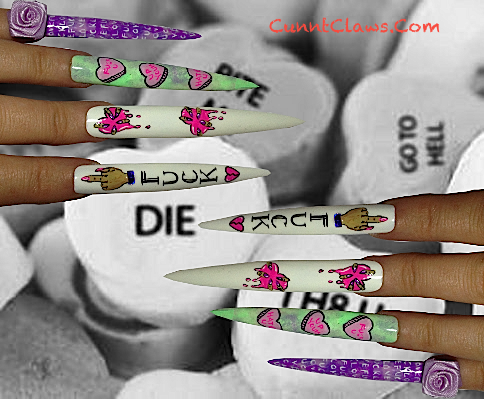 We started working more with more nail art companies. It was another huge jump in our career. 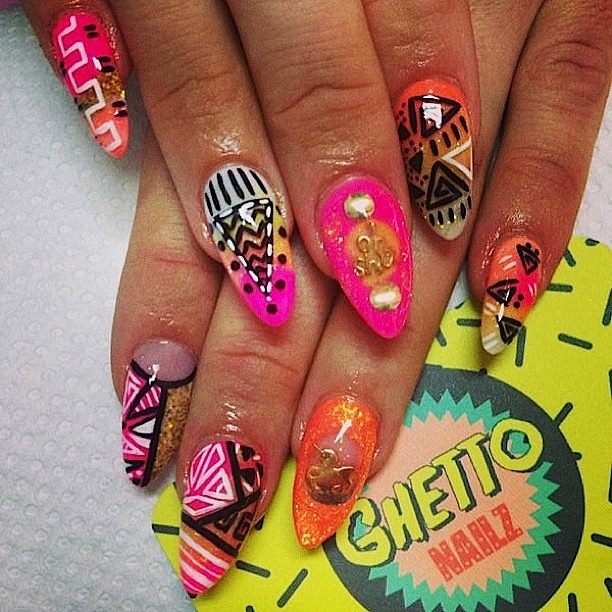 We started doing more and more work for, Ghetto Nailz and that is what we are still doing right now. Within the Ghetto Nailz crew, who is the best twerker? Andrea: I went to Los Angeles, and I was living there two years ago. That’s where my twerking started. Then, I went back to Spain and nobody knew what twerking was. 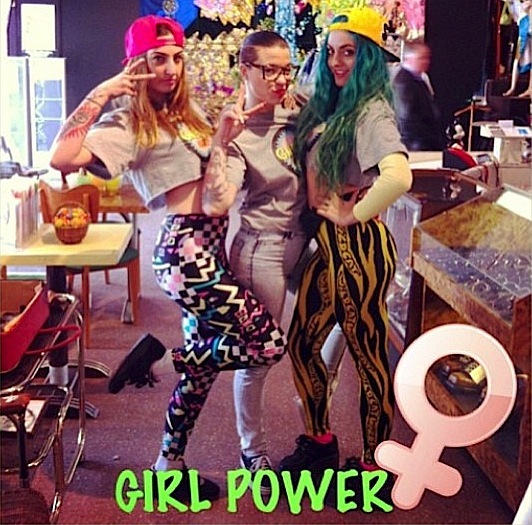 Ghetto Nailz brand representation displays “fun & free sprited” through tattoos, hair color, and vibrant attire. How do you deal with the stigma that stem from a more conservative crowd that do not understand your self-expression? Jessica: I think nowadays, people are opening their minds more. Now, we are starting to have more older ladies, who come into the shop to get their nails done. When they see us: they are like, “Oh, look at these girls, they look so crazy!” but they know we can do a normal job on the nails too. It doesn’t always have to be a crazy design. Like here in the, U.S. everyone loves our style but in, Spain we are like a reference for all the girls who are trying to find their own style. We wear short-shorts and we tell girls, “Don’t be afraid”, so now they wear short-shorts. I think we help them to open their minds more. Luz: At the same time, we do have classical clients that come to us, because they find us funny and different (laughs). They come into the nail shop to get plain nail designs and they tell us, “I just want something plain, but I like to look at you girls because you give me this happiness”. Jessica: They like looking at us, and it becomes a “fun therapy” –which we make many friends this way. They enjoy our company. 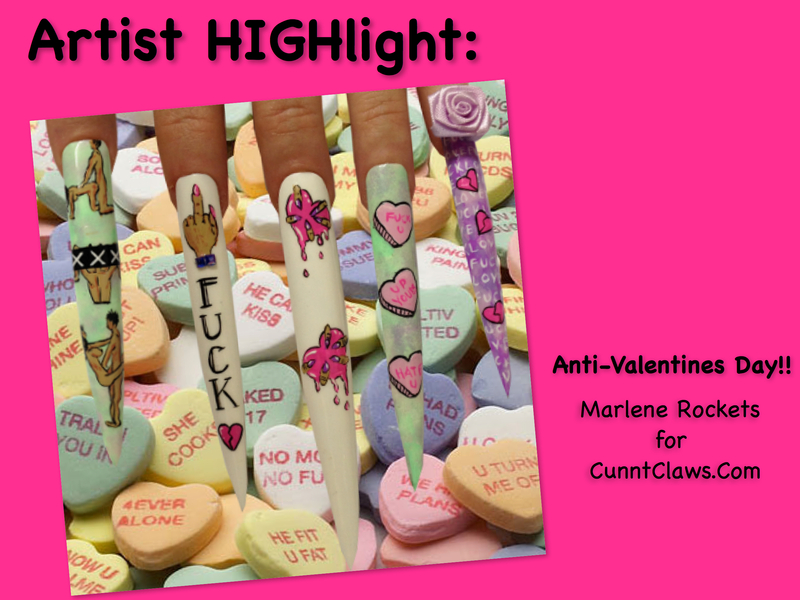 What kinds of, art are your nail designs inspirations driven from? 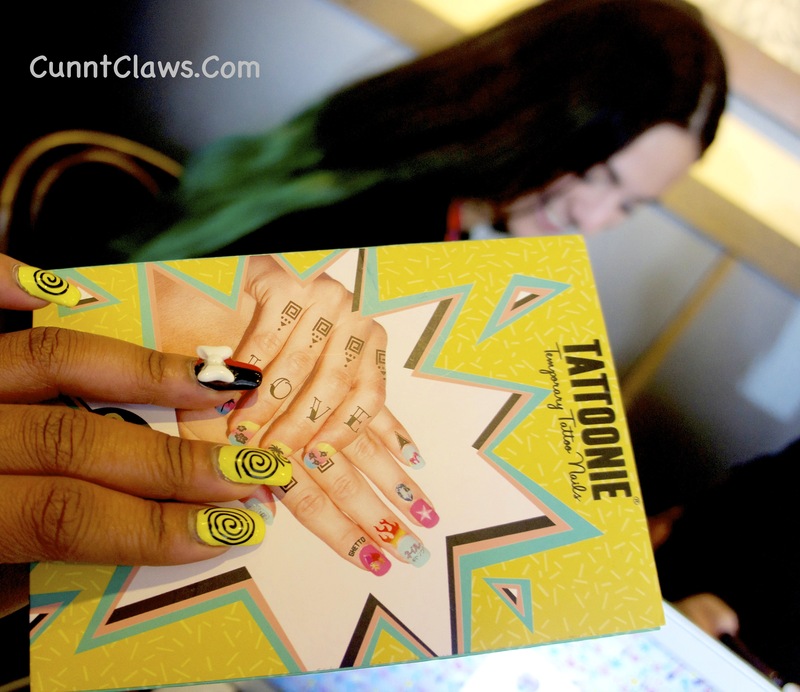 Jessica: When you think about, Ghetto Nailz you instantly think about; Pop-art, colors, and comic style which we are very good at doing on nails. 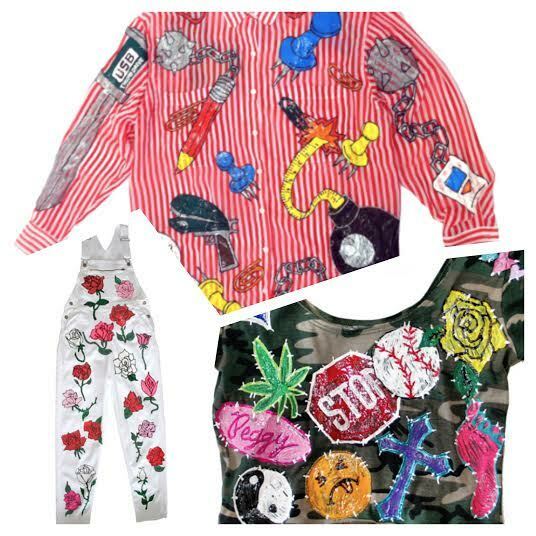 We love mixing colors…bold colors and prints- kinda like the styles from the 80’s. 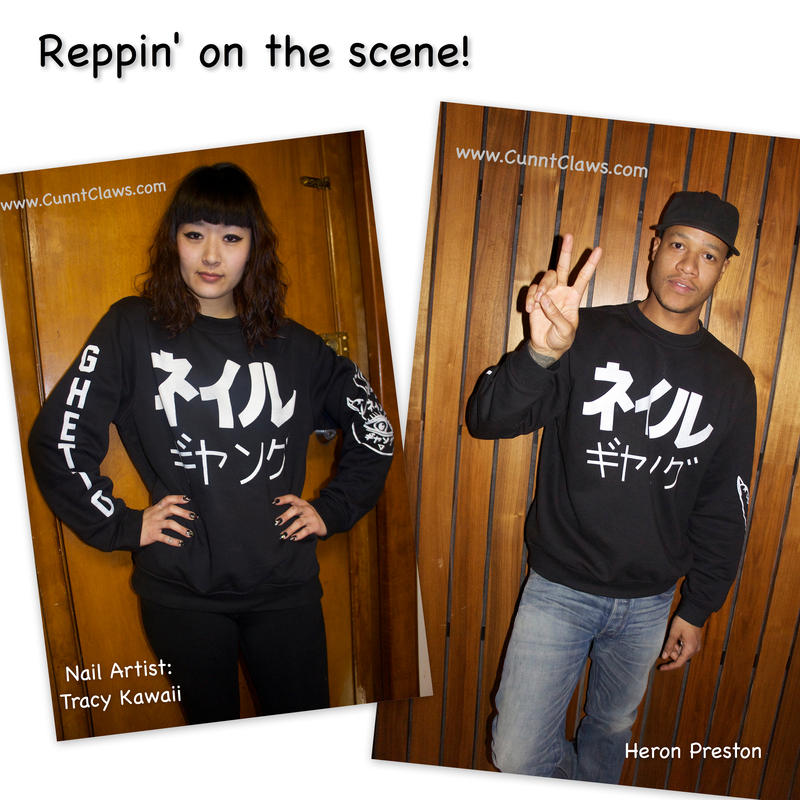 Then we draw other inspirations from another art movement called the, Memphis Movement from the 80’s and we love that! Their art are all the little black and white prints with the squiggle lines, along with the triangles. Luz: We use many different polishes. It depends on what color we like and are drawn to at the moment. Where is the must-go “turnt-up” spot in Spain? 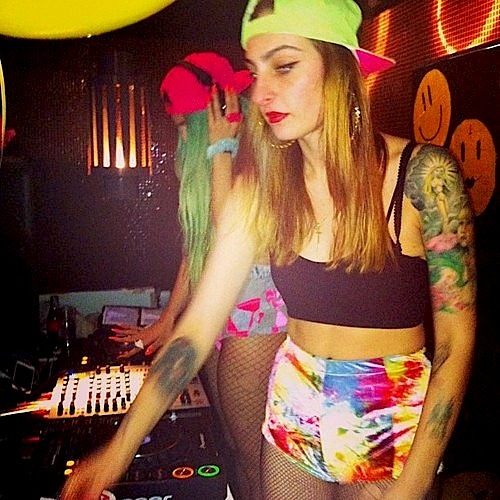 Luz: I, also host in a music club-Mondo Disko. They play a lot of electronic music and they opened up about fourteen years ago. Mondo Disko has the best line-up in the city. It is a really cool place to party. If you are trying to have a good time, you’ve got to come there! Jessica: There are not a lot of “turn-up” places right now, lol. When we saw each other a little under a year ago, you mentioned plans for your clothing venture, Soda Pop. Give us a brief update on its developments. 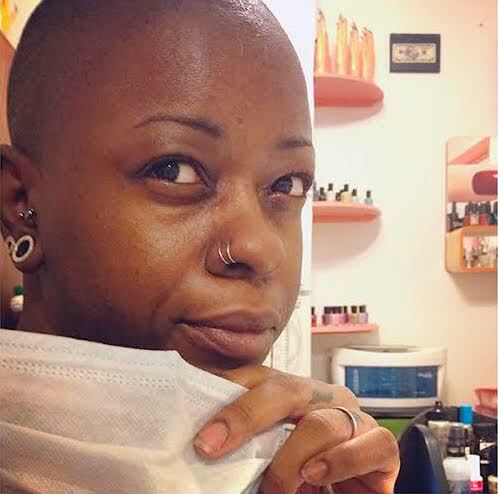 Jessica: I launched, Soda Pop three years ago, so now I have re-taken the line and Ghetto Nailz has defiantly helped me push it forward. Soda Pop is more like a lifestyle, where we mix the nail style with the clothes. It is always going to be in connection. So far it’s going well. I have a couple of spots where we are going to be selling in Miami, soon in New York, and the line is sold exclusively out of our shop in, Spain. We are defiantly expanding. What is your favorite part about conceptualizing Soda Pop’s design? Jessica: Making the prints! I love designing and doing the pattern and getting the first sample to see how it fits on the body. Every part of the process is really enjoyable. Of course, it’s a lot of hard work: getting the production done and following up with the factory, but it has to be done! 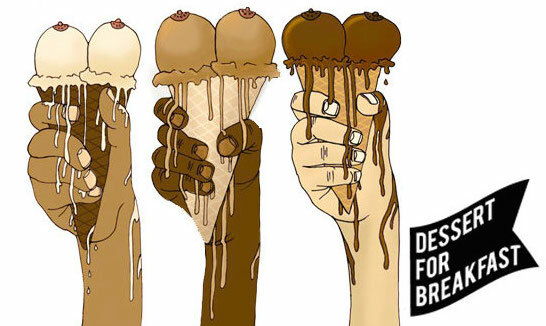 So, you can’t just say, “I just want to design”- you have to do everything business. How would you define, Spain’s fashion and how do it influences your personal style(s) individually? Jessica: Spain fashion does not influence us at all! We are actually influence by here (U.S). There are no trends created in, Spain. We copy the trends from; here in the U.S., London, Paris, California, and Japan. There is no single style where you can just say, “Hey that’s a Spanish style!”. Andrea: The city has a lot of good things, but nothing for us to really be influence by. Luz: I think the style at home is pretty boring. There is nothing really strong at home. The only true influences we have in, Spain is traditions. Like flowers, floral prints, and really pretty things. 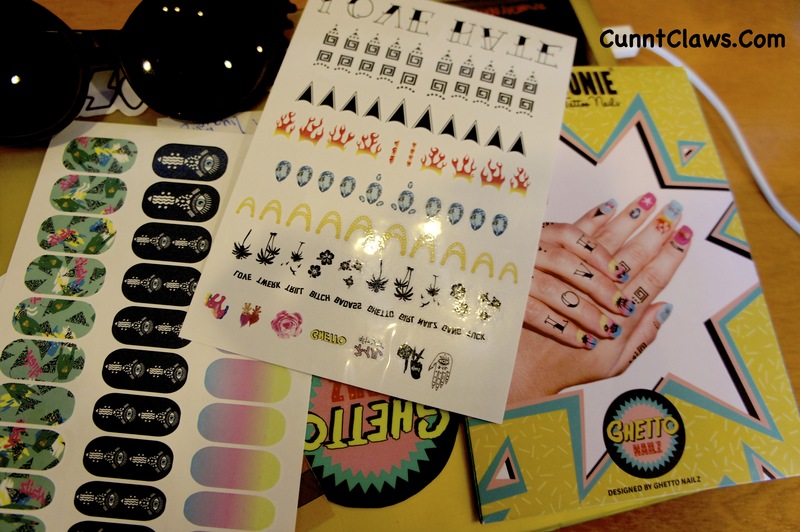 You girls recently teamed up with, Tattoonie Design to create temporary finger tattoos. Tell us more. Jessica: Yea, Tattoonie contacted us to do a fun collaboration. They are from, Valencia (One of the biggest city in, Spain). We did it and now we are trying to position th1em in a couple of stores, hoping it works out! Luz: These can help girls do their own, Ghetto Nailz manicure. It can be a nail sticker or a finger tattoo at the same time. My favorites are the; Trolls, My Little Pony and Ghetto Nailz print. Tell me some fun experiences you had while in NYC? Luz: Ha! I fell in love (laughs). Also, meeting new people and the parties. I think it’s so funny when we go out to a party, and we become the soul of the party! No one dances here! Spanish people are way more fun! People here go out to party and just stand there trying to be the coolest. Andrea: (Laughs) It was a fun experience! Jessica: Everything was amazing. We like to have fun! 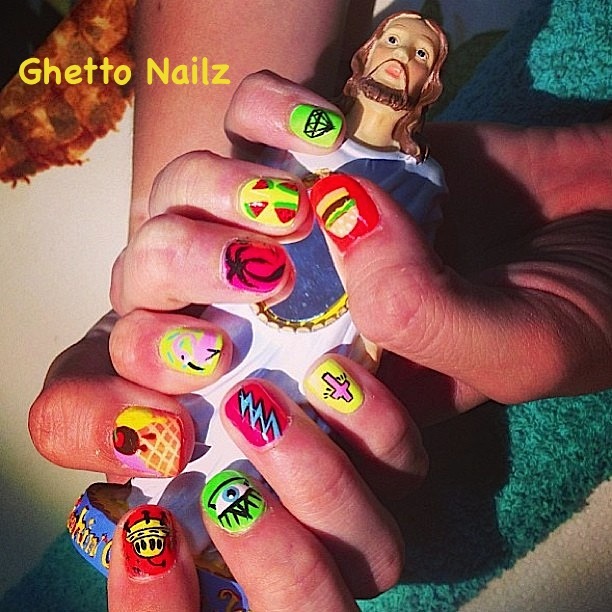 On this blessing joy ride, what is the next stop for Ghetto Nailz? Andrea: I’ve been there and everything is so cool over there! Everyone dresses really cool. Even the homeless people are dressed cool. I love it!